A quite unusual picture of Hope Street! Artist and poet Adrian Henri was at the centre of the thriving cultural scene in Liverpool 8, especially in the Hope Street area. He taught in the art college, and was often to be seen upstairs in O’Connors Pub at the corner of Pilgrim Street – now a costume hire shop but then on the circuit that took in the Everyman Bistro, the Philharmonic (pub), the Cracke and The Pilgrim. 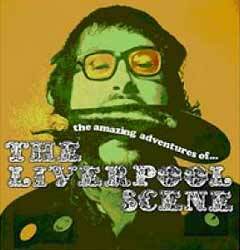 Henri performed his poetry along with the likes of The Scaffold (including Roger McGough, John Gorman and Mike McGear ) and as leader of the poetry-rock band Liverpool Scene. 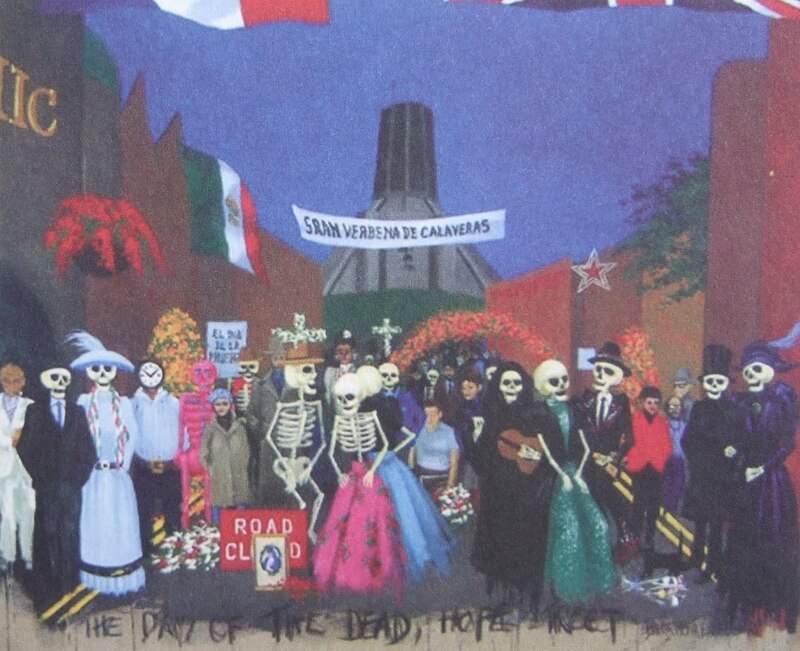 In the painting, among the figures in the crowd are artists and writers William Burroughs, Alien Ginsberg, Frida Kahlo, Ed Kienholz and Henri’s Liverpool painter friend, Sam Walsh. In the main painting shown here the white suited, pipe-smoking figure on the far left is Malcolm Lowry. Lowry was the alcoholic author of the brilliant novel, Under the Volcano. He was brought up in Birkenhead and referred to Liverpool as that terrible city whose main street is an ocean. Apart from the opening chapter, the novel is all set on the Mexican Day of the Dead when the hopelessly drink-soaked Consul who is the subject of the book dies. There is a very good overview of Lowry himself in a Guardian article. Henri also painted another imaginative piece, The Entry of Christ into Liverpool. This refers back to James Ensor’s 1889 painting, The Entry of Christ into Brussels. It is fascinating to see how we can put imaginative ‘maps’ or ‘representations’ over the everyday city we inhabit. 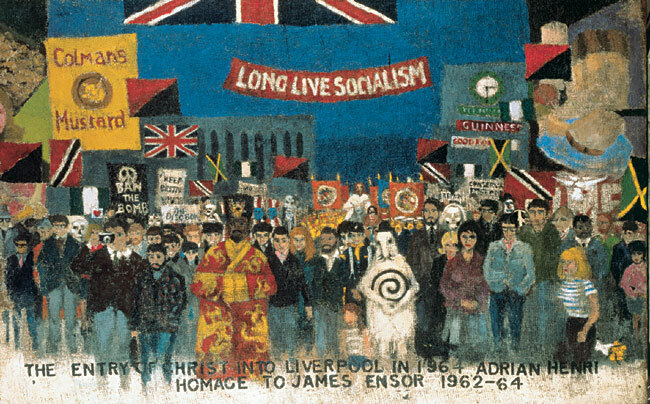 Figures in the painting include the Beatles, John Gorman and Roger McGough (Scaffold), William Burroughs, Charlie Mingus (jazz musician), Arthur Dooley (the Liverpool sculptor), James Ensor as Christ on the donkey, and many of Henri’s friends.